The Hornady V-MAX line of ammunition was created for varmint control, as the bullet has a thin jacket and was designed to fragment on impact with a target, even at low velocities. For many years, your standard varmint ammo was pretty much whatever you had on hand, and this produced mixed results depending on what you were shooting. The V-MAX has a lot of features to make sure any critter is humanely dispatched immediately and is extremely accurate. Polymer Tip: The tip of the V-MAX bullet, like some other Hornady ammo lines, is made of a hard polymer. This increases accuracy compared to a round nose or hollow point, increases the ballistic coefficient, and ensures expansion on impact. You can think of this like a hollow point plugged with plastic – when that plastic hits something, it’s forced into the base of the bullet, causing explosive expansion. Swaged Lead Core: Swaged lead is one of the more popular cores for bullets, as the process of swaging gets rid of most imperfections in the metal. This leads to more uniform performance with each shot fired. It was created so the lead core expands and fragments on impact, leading to devastating results on soft targets. Base Options: The V-MAX line offers a flat base as well as a boat-tail, so you can select one that is best suited for your use and the weapon you’re going to use. In general, boat-tailed bullets maintain stability better at longer ranges and lower velocities. Just like the A-MAX was created for target shooting, the V-MAX has a very specific use – varmint control. Many people grew up with a .22LR and that was the main way to keep undesirable critters off your property, but standard bullets simply weren’t that accurate. If you head out to the range right now with a round-nose or hollow point, and a .22 or even a .308 caliber rifle, you’ll know even good brands that use that bullet type simply aren’t as accurate as newer bullets. The V-MAX is also a nice long-range target shooting ammo, but if you shoot often, you might find it difficult to go back to less premium brands or ammo lines. 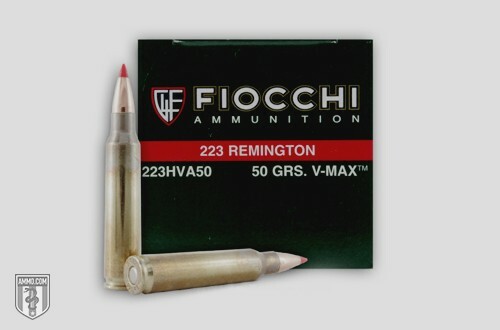 This is great varmint control ammunition, and there is almost no negative feedback about it. That’s pretty rare for any product, so it’s a great sign for ammunition reliability. The bullet design is state of the art and you can get this in a wide range of rifle calibers. If you’re looking for something similar, but in more of a "novelty ammo," check out the Z-MAX ammo line, also from Hornady.